This is a recipe of my mother's that I have been making for years. I believe it came from an old "copycat" restaurant cookbook she had. The paprika sprinkled with the cheese gives this bread a beautiful color and delicious flavor. This is one of my go-to recipes when I think to myself, "I am having company over and I need a delicious bread to serve them." Usually those same guests end up leaving asking for the recipe. 2. Cut the bread in half lengthwise. Rub one garlic clove over the crust of the bread. 3. Press the rest of the garlic you just rubbed over the crust, and the remaining clove, through a garlic press into the melted butter. 4. Brush the cut surface of the bread generously with the melted butter. 5. In a small bowl, combine the parmesan cheese, parsley, and paprika. Sprinkle the mixture over the butter coated surface of the bread. 6. Place the bread on a cookie sheet, cut side up, and bake 5-10 minutes or until lightly browned. 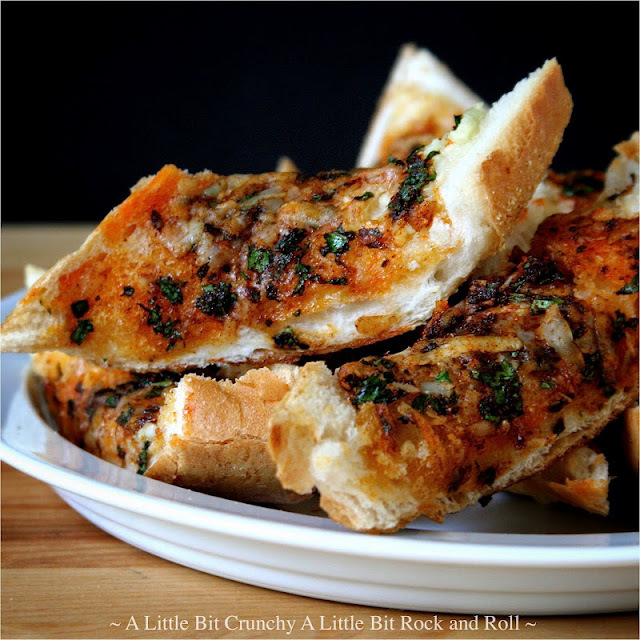 garlic bread.........drool!! Looks awesome and crazy simple to make! Oh my goodness! I sooo love easy and delicious...this sounds amazing. Thanks for linking up to Weekend Potluck! !